Labonté, R., Runnels, V., Packer, C. and Deonandan, R. (eds.) (2013). 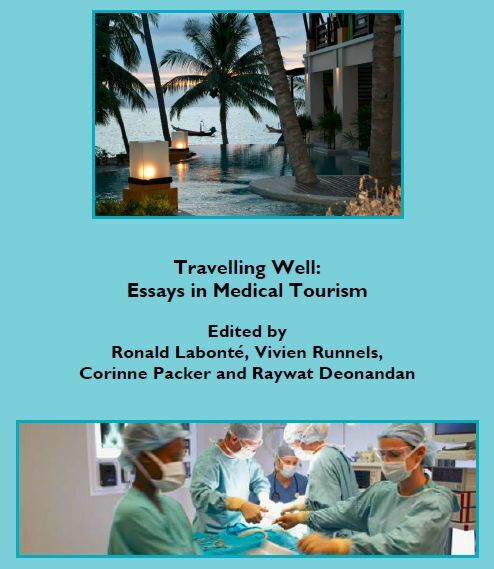 Travelling well: Essays in medical tourism. Transdisciplinary Studies in Population Health Series, Vol. 4 Issue 1. Ottawa: Institute of Population Health, University of Ottawa. Our latest (non-fiction, academic) book has just been published and is being offered free of charge as an ebook at this URL. (It’s a large PDF file). The opening years of the 21st century have been characterized by a variety of technological, social, political and economic factors that have seen the disintegration of the meaning and importance of international borders. From the power of the Internet to link disparate populations, to the consolidation of blocs of politically intertwined nations such as the European Union (EU), and the rise of affordable international travel, forces have been combining to bring about a globalized world economy that was only theorized in decades past. An obvious facet of this new globalization is the permeability of borders to the movement of consumers seeking a variety of medical services, and providers willing to accommodate, if not also profit, from this demand. My chapter is titled, “An Introduction to the Ethical Dimensions of Reproductive Medical Tourism“. Happy reading!